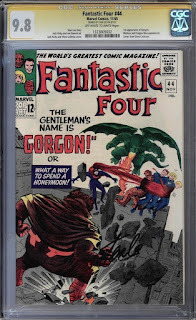 Up next in part 2 of this Inhumans key issue list is Fantastic Four #44, and the first appearance of Gorgon. Eme Ikwuakor has been cast to play this role in the upcoming Inhumans T.V. show, airing on ABC later this year. It would seem that Marvel plans to play the first two episodes in IMAX theaters on Sept. 1 of this year. I have no idea if the first two episodes are going to be filmed in the 70mm IMAX format, or the regular 35mm format that most movies are filmed in. I'm hoping for the former, but it will most likely be the latter. Ok, let's talk a little about this key issue. 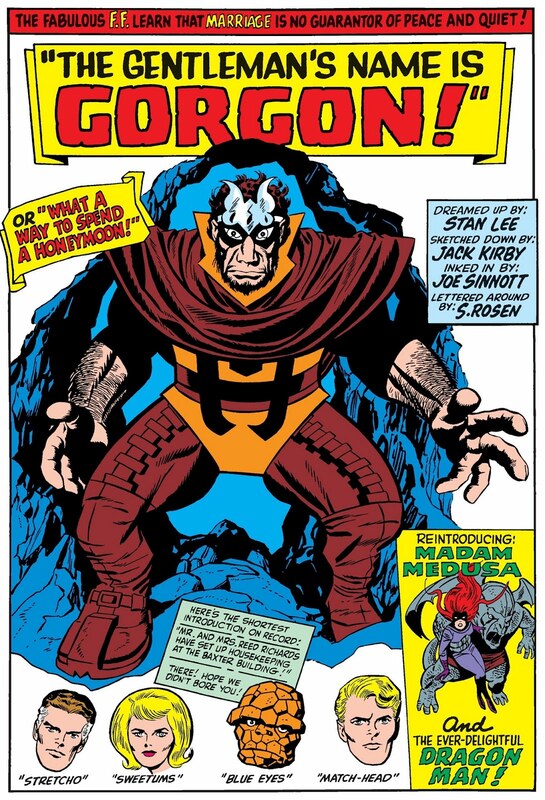 This is an important Inhumans key because it has the first appearance of Gorgon, who just happens to be the cousin of Black Bolt and is also a member of the Royal Family. He was sent by Maximus the Mad to search for Medusa and bring her back to the Inhuman city of Attilan. We don't learn any of this in this issue, only that he is there to bring her back to "where she belongs". 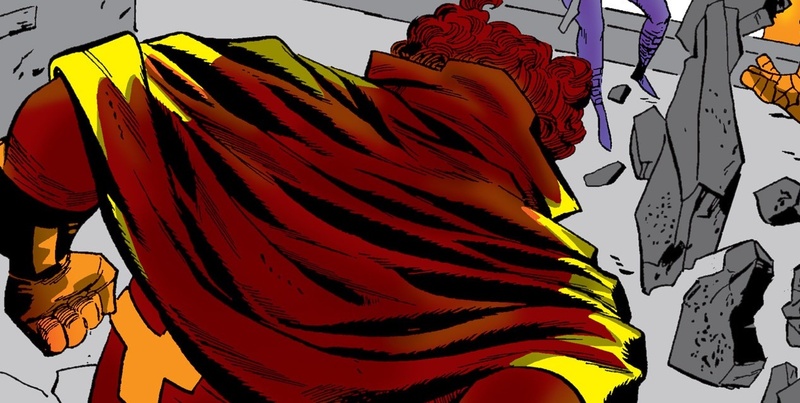 If you're wondering who Maximus and Black Bolt are, and where Attilan is at, don't worry, I'll be talking more about them in the next couple of posts, so stay tuned for those. Besides having the Inhuman powers of enhanced strength and durability, Gorgon also has the ability create intense shock waves that could level a city, simply by stomping his hooves on the ground. Yes, he has hooves. Did I forget to mention that? I really must say, he is a very interesting looking character, to say the least. 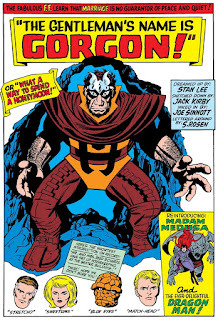 This issue also holds the second appearance of Dragon Man, the android creation of Professor Gregson Gilbert. Dragon Man doesn't do a whole lot in this issue except create havoc and a lot of problems for the Fantastic Four, oh, and fly away with a car that just happens to have Medusa in it, helping her escape being captured by Gorgon. 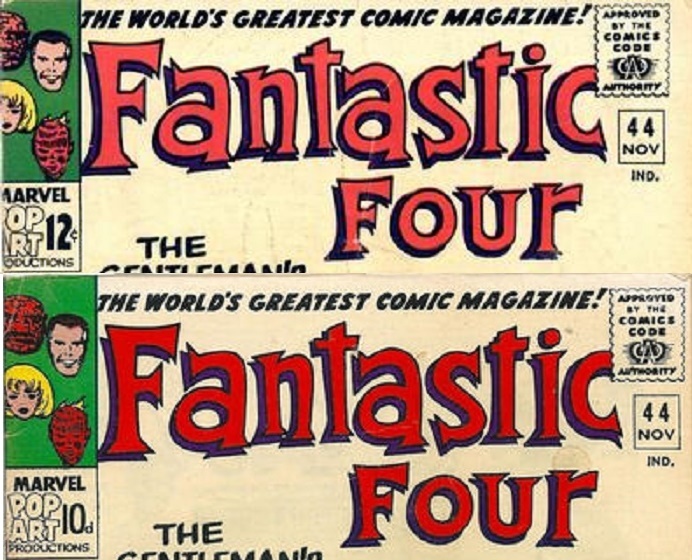 Both Dragon Man and Professor Gilbert make their first appearance in the pages of Fantastic Four #35. Where FF #36 didn't have a UK pence copy that I could find, this issue most certainly does. Both of these covers are almost identical, with the only exception being the price on the cover. Where the U.S version has the 12¢ in the upper left hand corner, the UK version has 10d, as you can see in the picture that I've provided. If the picture is too small, simply click the image to enlarge it. These UK variants had a very small print run when compared to the U.S. copies. Some sources say that they only make up around 5% or less of the total print run. That can make these variants much harder to find, but, usually the UK copies don't demand as high of a price as their U.S. counterparts, even with the lower print run. They have, in recent years, started to see a rise in value as more and more people are starting to gun for lower print run comics, both new and old. There may be other foreign editions of this comic out there, however, if there are, I couldn't find any information on them. 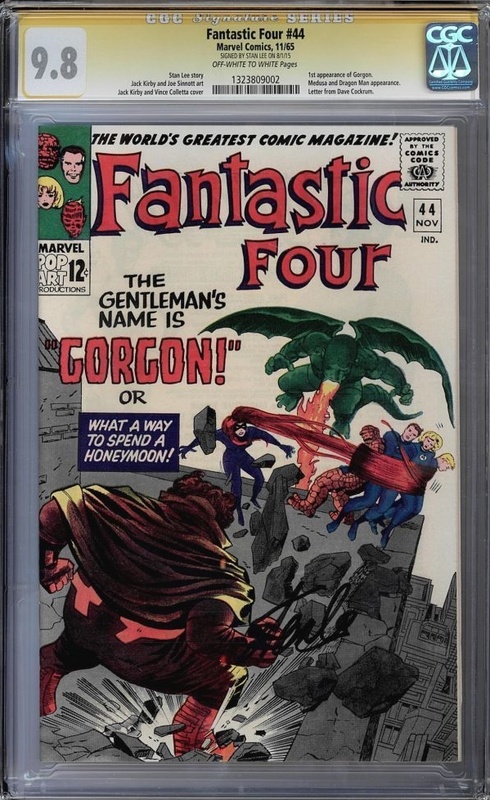 All together, CGC has 741 copies of FF #44 listed in their census. In this case, two of those 741 copies are UK variants. That leaves 739 for the U.S. edition. That low number can give you a good idea of how rare the UK edition is. Both of the UK edition copies are graded a mid-grade 6.5 F+. Looking at the 739 copies of the U.S. edition, surprisingly, most of them are a nice high grade between 8.5VF+ (84) all the way up to 9.8 NM/M (10). There are quite a few 9.4 NM (107) copies out there though. However, there are quite a few of them that have a Restored label, 30 in total. So, the census isn't too bad, not too high and not too low, for this issue, unless we're talking about the UK version, then it's microscopic. For this section, I couldn't find any information on the UK edition to compare sales to the U.S. version. The sites that I use for research may just mix both of these editions together and not differentiate between the two. Or, the sales for the UK edition might be so scarce, that there really isn't any information on them. After all, there are only two of them listed in the CGC census. So, I'm writing this up assuming that all of these copies are the U.S. version. The first appearance of Gorgon definitely doesn't demand the same amount of coin as the first appearance of Medusa does. In Sept. of 2016, a 9.6 NM+ copy sold on eBay for $686.36. Compare that to a 9.6 NM+ copy of FF #36 that sold in April 2015 for a staggering $7,499. This could have a lot to do with the fact that there are a lot more high grade copies of FF #44 than there are of FF #36. Either way, that a huge price gap. Anyway, getting back to this issue, high grade 9.0 VF/NM copies are hovering around the $200 range, which is only up about $100 from where it was five years ago. Even 9.4 NM copies are barely braking the $400 mark, and usually selling quite a bit below it. The 9.4 NM copies have remained pretty consistent value wise over the last few years, with the exception of when the movie hype was everywhere. At that time, there was a nice little boost in value, topping out at around the $800 mark, but have obviously come down a lot since then. 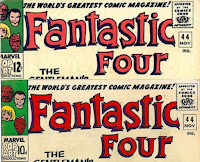 Even though this is a more "affordable" book than FF #36, there still may not be a significant increase in value for this comic. Like I said before, there are a lot more high grade copies floating around out there. However, if you're able to find a rare UK copy somewhere, it may be worth picking up, if the price is right of course.